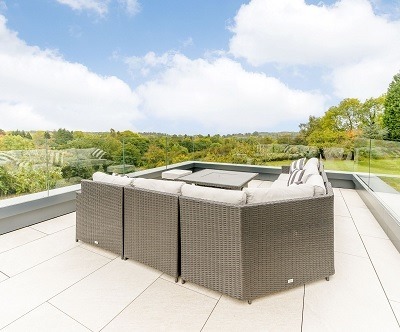 We were recently contacted by a homeowner in Worcestershire who wanted to update the look of her outdoor terrace. She was experiencing some problems with the terrace’s original brick piers as well as the decking she had installed in this space previously – the boards looked old and tired, and worse still, became dangerously slippery when wet. 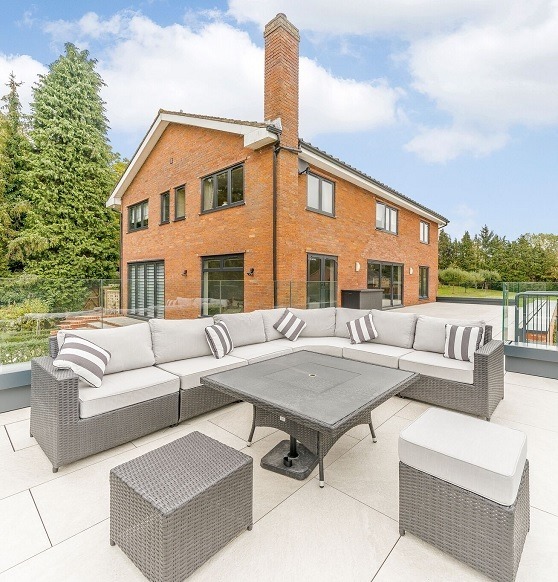 This customer found PrimaPorcelain via an Internet search and determined that our stylish, contemporary-looking paving slabs were exactly what she was looking for. 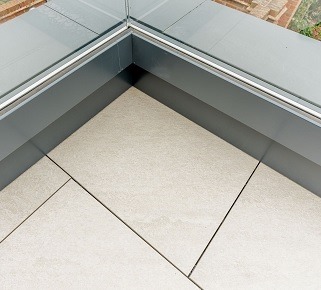 Not only would our Quartz Sunrise paving completely refresh the terrace’s appearance, our slabs would also provide a slip-resistant surface during spells of wet weather. “The PrimaPorcelain team were very helpful and it was exceedingly useful to receive a CAD drawing of what the finished space would look like. “The installation went well, and the installers were very professional and courteous. “We are delighted with the finished space, and we’ve had lots of compliments from visitors. Our customer in Dodford took advantage of our CAD patio design and paving installation services to ensure that the whole project went as smoothly as possible. 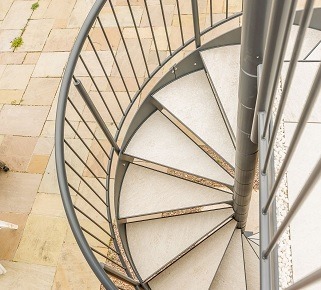 One particularly unique aspect of this project is the spiral staircase that runs from the terrace down to the customer’s garden – we used aqua-cutting techniques to turn our Quartz Sunrise paving slabs into attractive treads for this staircase (manufactured by another company, with whom we worked closely during this job), and we think the results are absolutely wonderful. Would you like to transform your outdoor space with PrimaPorcelain’s low-maintenance, slip-resistant paving slabs? Order your FREE samples now! See more photos of this project on Pinterest!